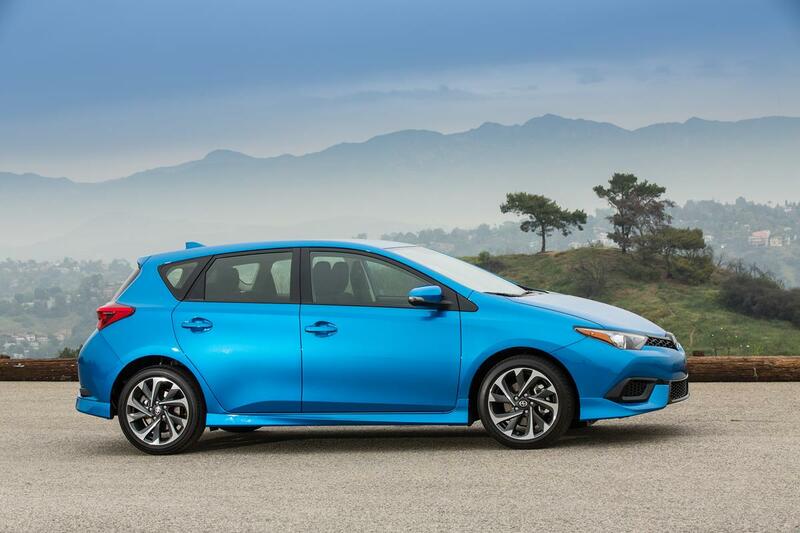 If the badge on the all-new 2016 Scion iM stood for “instant message,” the message to young buyers would be that they can now get a fun-to-drive, high-style, high-content, high-MPG rated hatchback for a whole lot less than they’d expect. The all-new Scion iM arrives in dealerships this fall, starting under $20,000. In true Scion practice, that’s for a mono-spec model equipped like an upgrade model from competitors. 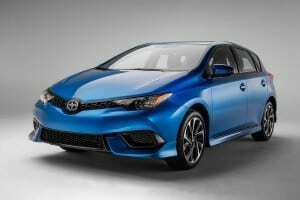 The Scion iM hatchback joins the all-new 2016 Scion iA sedan for a one-two punch in the subcompact and compact segments. The all-new 2016 Scion iM is the answer for young buyers looking for a sporty hatchback, but who still need to pay for things like rent, food, school loans and weekend fun with friends. Its bodylines are ripped. The cabin is roomy, refined, versatile and high-tech-equipped. The 1.8-liter DOHC Valvematic engine is eager to rev and very easy on gas. The chassis, with sophisticated double-wishbone rear suspension and standard 17-inch alloy wheels, is ready to smooth out urban bumps and tame adventurous curves. 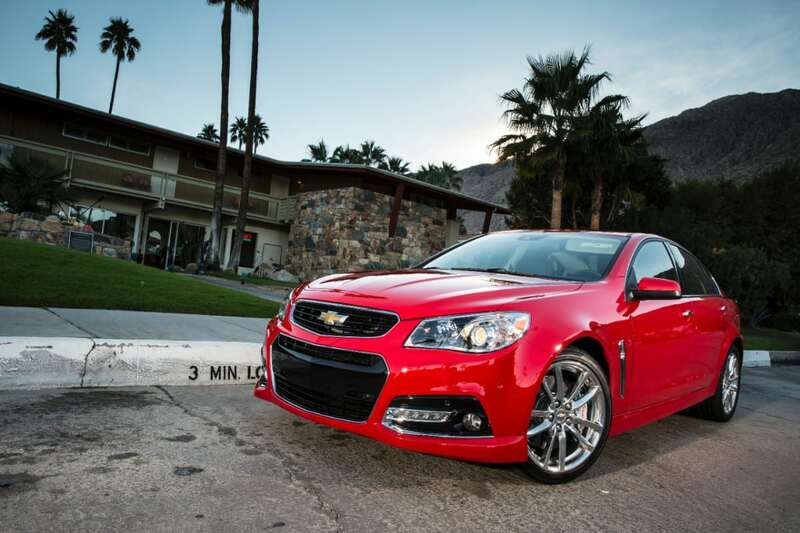 For more hands-on driving fun, a six-speed stick shift is also available. For safety, the 2016 Scion iM comes with eight standard airbags, including a driver’s knee airbag and a front passenger seat cushion airbag. In the name, the “i” stands for individual. Intriguing. Easy on the customer’s income. For the M, think modern,multi-faceted and magnetic. The iM could be a first new car, but don’t call it “entry level.” It will easily compare to hatches that start in the same price neighborhood but then demand a higher tax bracket when you add in needed upgrade options. The Scion iM shows a familiar face, with a hexagon lower grille, sharp-eyed headlights and side bezels with honeycomb mesh pattern seen also on the brand’s FR-S sports car. 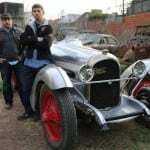 That aerodynamic expression carries into the profile, which conveys dynamic movement from the lower front to the rear. It’s like a “swoosh line” rendered in steel. 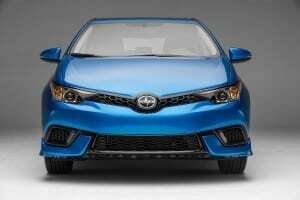 Detailing on the Scion iM belies the affordable pricing. The piano black grille treatment, standard sporty body aero kit, LED daytime running lights and taillights leave an unmistakable signature. Also true to the Scion way, the color selection gives the design tremendous visual pop: Blizzard Pearl, Classic Silver Metallic, Black Sand Pearl, Barcelona Red Metallic, Spring Green Metallic and Electric Storm Blue. Gas prices come down. Gas prices go back up. Young buyers like to avoid pain at the pump no matter what. The 2016 Scion iM offers a sweet spot of performance and efficiency, with Scion estimating a 37-MPG highway fuel economy rating. Then comes the fun side. The 137 hp 1.8-liter 4-cylinder engine uses Valvematic continuously variable valve timing (lift and phasing) technology to offer a broad torque curve, so the iM feels responsive in all situations. 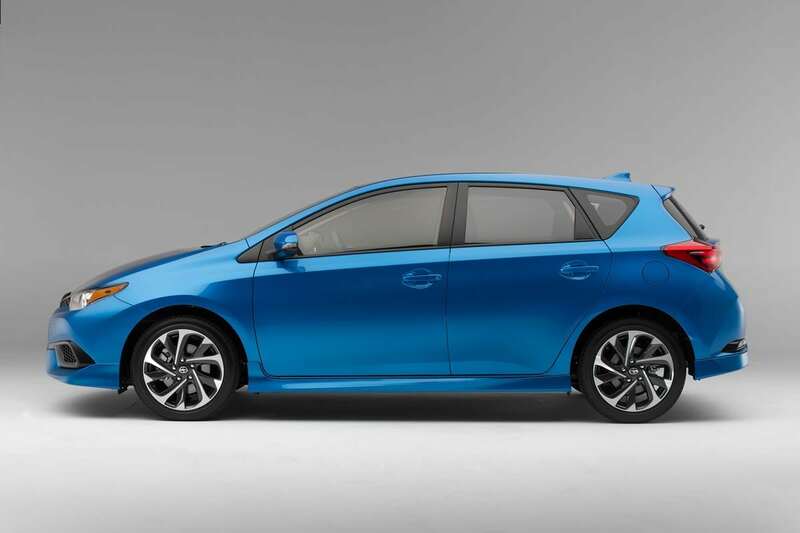 For driving purists, the Scion iM has a standard 6-speed stick shift that’s a slick shift, making for an engaging and active driving experience. Got hills? The Scion iM comes standard with Hill Start Assist, which helps prevent roll-back when you’re pulling away from a stop sign or traffic light on an incline. The optional automatic is also perfectly suited to the 1.8-liter engine. It’s an intelligent Continuously Variable Transmission that’s been sport-tuned for driving pleasure. That’s why it’s called the CVTi-S. Not all CVTs operate as responsively as the CVTi-S in the Scion iM. This one’s got both a Sport mode as well as manual shifting capability with seven stepped shift points. In Sport mode, the CVTi-S alters shift points and also provides a livelier feel through the electric power steering programming and accelerator responsiveness. G AI-SHIFT logic detects lateral G force during cornering and maintains engine speed by restricting unnecessary shift changes. Using the console shifter, the driver can make fast, sequential shifts through the transmission’s seven predefined steps, accompanied by the familiar sense of positive shift engagement. The 4.2-inch TFT multi-information display within the instrument cluster displays M mode activity, including the “gear” position, and other vehicle information. 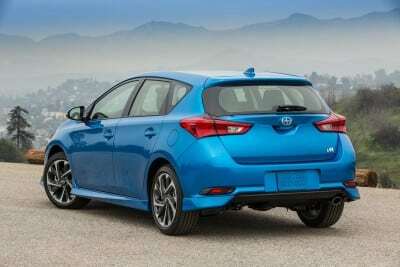 In the Scion iM, instant gratification behind the wheel will turn to long-term love down the road. Driving enthusiasts know well the value of a high-strength body structure and a sophisticated four-wheel independent suspension. 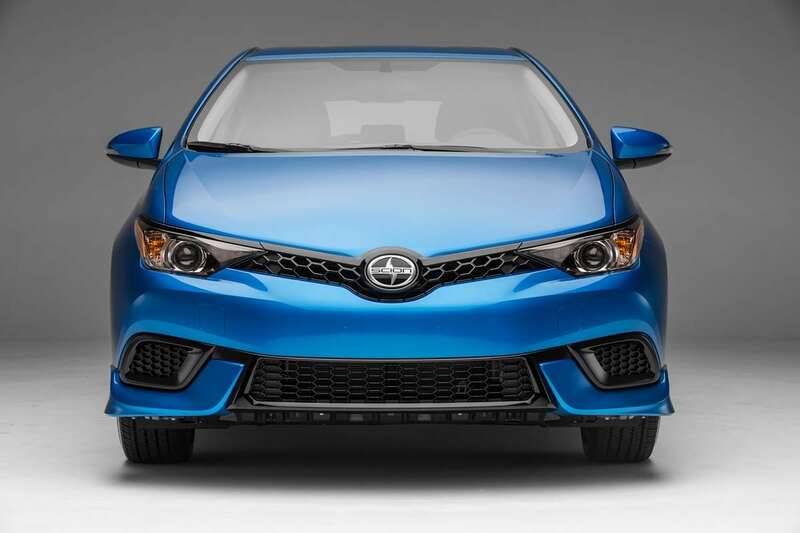 Based on the tC sports coupe platform, the 2016 Scion iM checks those boxes by using ample high-strength steel and special reinforcements in the structure. And it goes further, making the rear suspension the double-wishbone type, a design offering the added benefit of not impinging on cargo room. Add in standard 17-inch alloy wheels with fat 225/45R17 tires, and the Scion iM delivers a tight, taut road feel and a compliant ride quality. The Electronic Power Steering (EPS) system makes low-speed maneuvering a breeze and provides good feel and less assistance at highway speeds. 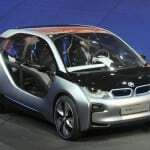 It also helps boost fuel efficiency, because the system consumes power only when assist is needed. Inside, it will be love at first seating in the standard bolstered front sport seats. 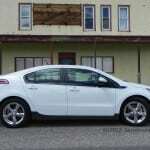 They fit the body like a glove and also integrate a Whiplash Injury Lessen (WIL) structure for occupant protection. 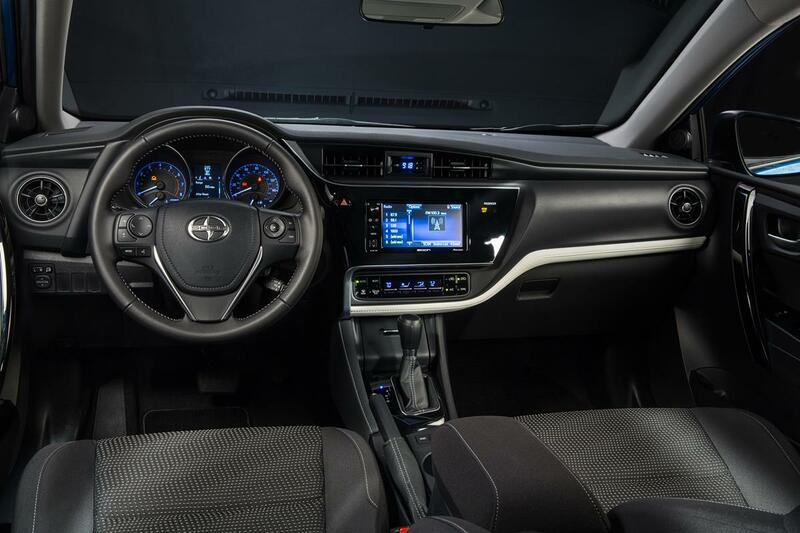 High quality materials abound throughout the Scion iM cabin, where the layered dashboard design combines sports car-inspired instrument panel styling with easy to reach, easy to use controls. With ideas borrowed from the luxury car realm, the Scion iM keeps noise outside with an acoustic layer windshield, foam-type insulation and floor silencer sheets. The Scion iM’s premium feel on the road is matched by a lengthy roster of premium amenities – all included as standard with the brand’s famous mono-spec strategy. Start with versatility, which comes from the 60/40 fold-down rear seats and standard cargo cover. A roomy glove box and console box are augmented by numerous front door pockets and storage bins throughout. 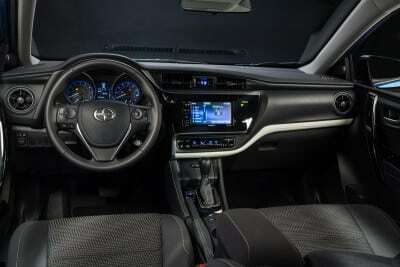 As a Scion, the iM naturally comes with high-grade standard multi-media system. The 6-speaker Pioneer sound system will play from a variety of sources, including iPods, of course, and other devices. You control it all through an easy to use 7-inch Pioneer Display Audio unit that also includes standard HD Radio and Aha. It’s through that screen that you view the standard rear view backup camera. Real leather wraps the steering wheel, an unexpected detail in this price class. The sporty wheel puts fingertip switches for audio, multi-info display and hands-free phone calls via Bluetooth at your fingertips. The 4.2-inch color TFT multi-information display (Scion’s first) between the main instrument gauges provides displays for the car’s audio system and other functions. The Scion iM keeps the value surprises coming. All cars in this segment come with air conditioning; the Scion iM steps up a class with dual-zone automatic A/C control. And on cold mornings, the color-keyed heated power-folding exterior mirrors (yes, standard power-folding mirrors) get fog or frost cleared up in a hurry. Auto on/off headlamps are another convenience inherited from a higher segment. Navigation upgrade kit, body graphics, cargo area enhancements, interior light kit, all-weather floor mats and more. 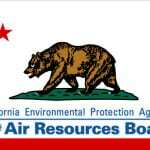 A roof rack system expands versatility. The Scion iM will also offer a line of TRD (Toyota Racing Development) performance accessories, including an air intake system, anti-roll bar, lowering springs and more. Scion drivers love their pets, and so does Scion. The iM will offer a range of cabin enhancements to take the stress out of carrying furry friends. Available through dealers, pet-friendly accessories include a dog harness with tether, door guards, seat pet barrier and even a grass pad, which discourages your doggie from standing on center console.